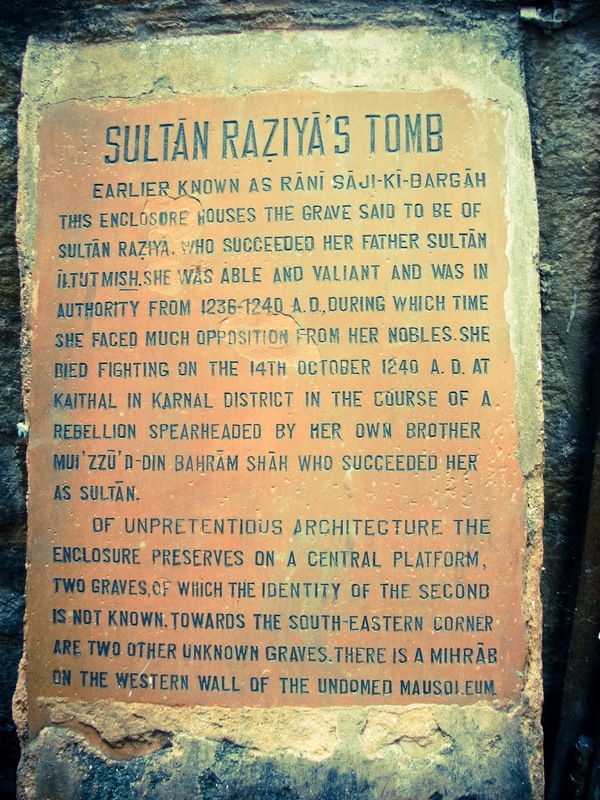 The story of Razia Sultan is way more interesting than what is found on an obscure plaque, buried in a crowded, bustling neighborhood. 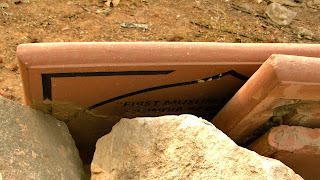 But a plaque is where it began for me, as I found her name on a broken stone near Qutub Minar. 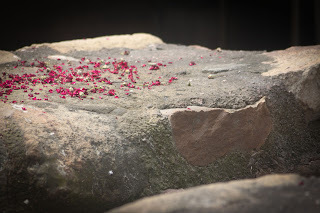 I then began to ask why I couldn't find another, replacement stone in the Qutub complex area itself--just who was Razia Sultan, besides being the daughter of Iltutmish? Before he died, Iltutmish appointed his daughter Razia to be the next Sultan of Delhi. His sons were too irresponsible and wasteful, he said. Razia, who had not been raised among the women of the harem, had learned sword fighting, battle strategy, and leadership skills along with her brothers because her father had taken a personal interest in her education and training. By the time she was thirteen, she was acknowledged as an accomplished archer and horse rider who would frequently accompany her father on his military expeditions. Razia had also already once demonstrated her ability to keep the nobles in line and run the affairs of state while her father was away in battle and she was interim governor. Iltutmish was sure she was the right one for the job. The nobles, however, were not at all supportive of his decision. 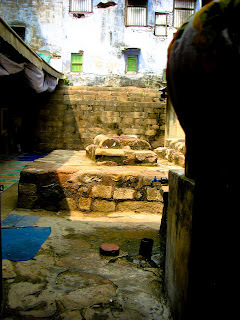 When Iltutmish died, they put her older brother on the throne instead. He was an awful ruler who spent his time partying, while his mother ran things and put plots in motion to execute all of his rivals, Razia included. Razia brought the matter to the public court, demanding justice. There was an outcry from the people; her brother was deposed and his mother punished. The people wanted Razia made ruler in his place. The nobles had no choice but to do as they wished. As ruler of Delhi, Razia refused to be called 'sultana', because that title was used for the wife or consort of the sultan. She would answer to the title of 'sultan' only. She had never been trained in the customs of women of her day--those are things you learn in the harem, where she hadn't spent much time. So now that she was sultan, she dressed in men's tunics and headdress, and rode with her face unveiled when she led the army into battle. It was likely Razia knew her reign would be short and lonely but that she had nothing to loose by accomplishing as much as she could. She got right to work establishing schools, research centers, libraries, and building her father's tomb. She was a good politician, managing the nobles and her enemies, gaining the favor of both the people and the army. She was good at her job, just as her father suspected she would be. But the nobles were wary--she was still a woman. And this is when Yaqut entered the picture. 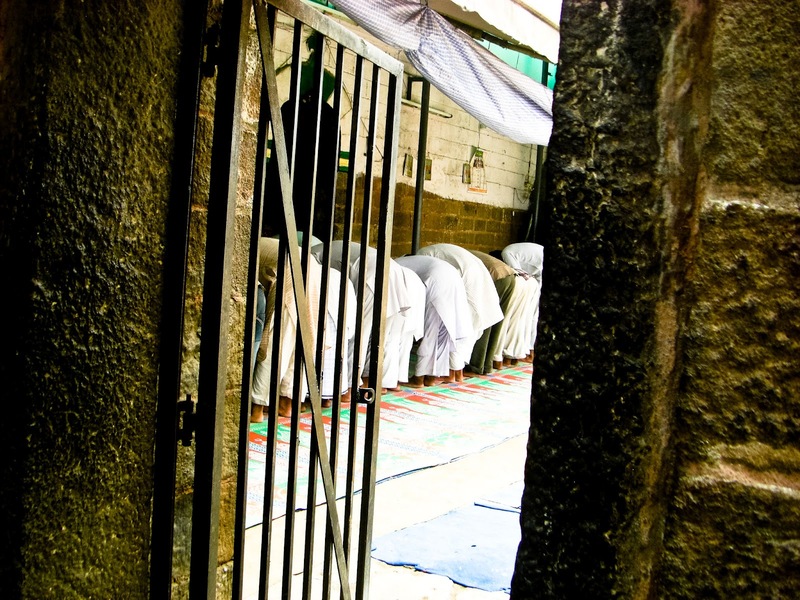 Jamal-ud-Din Yaqut had climbed the ranks among loyal and trusted courtiers from slave to amir. Razia appointed him to a high position and made him one of her closest advisers. The problem was that he was of African descent and most of those in power were of Turkish lineage--they didn't want an outsider moving in. From that point, it was easy for those who disliked Razia as sultan to start rumors that the relationship between her and Yaqut was illicit and to turn others against her. Was she really having an affair with Yaqat? Historians don't seem to agree. Some say he was only an adviser and friend. Others say the two spent far to much time together and he look liberties, such as helping her on to a horse--flagrantly inappropriate. Rumors flew. It didn't matter anymore what was true about the relationship, the nobles already resented her as ruler and now others turned on Razia. Another formerly-trusted courtier, Malik Altunia, had raised a rebellion against her and she had another battle to fight. So with Yaqut, she led her loyal army out to battle. But it was Ramadan, and the men of the army fasted from food and water all day. By the time they reached the enemy, they were exhausted and easily defeated. Yaqut was killed in the fighting and Razia was imprisoned by Altunia. According to the comic book version of history, Altunia had long been in love with Razia. But she had put him off, placing her position as sultan first and refusing to share the throne with anyone. So it was jealousy that provoked his uprising against her, and now that he had her in his prison she had no choice but to marry him. The motivations of Altunia and Razia are speculation only, but marry they did, within three days of her capture. And now there was another problem: while she was out of town, her younger brother had taken over the throne of Delhi. Altunia and Razia set out to take it back. Their forces were defeated by her brother's army, and here's where history isn't sure what happened. One version says they were killed in battle and that is the end of the story. Another says Altunia and Razia fled the battle scene and the two of them were abandoned by their remaining army in a rough, wilderness area far north of Delhi. Here they were robed and killed by peasants. Now that's a tragic ending. So after all of that drama and historical intrigue, you're convinced that Razia Sultan is an important figure in Indian history, right? She was the first Muslim woman ruler in India, and she was good at it. There's a well-known comic book about her, a movie and she even features in the light show of Lovers of Delhi at the Purana Qila. Surely her tomb is well taken care of, right? First of all, there are conflicting claims as to where her tomb really lies. The most popular claim is that she is buried with her sister Shazia in Chawri Bazaar, Old Delhi, near the tomb of Shah Turkman--of whom she was a follower and who had died around the same time. Another claim is that it is in Kaithal Haryana, where she was killed--also a forgotten place. Both of these tombs have no markings to say whom they belong to. And the third claim is for a place far south of Delhi in Tonk, Rajasthan. That one is based on an inscription that scholars have recently translated to say it is where Yaqat and Razia lie--but then where is Altunia? He doesn't show up at any of these sites. I've started with a visit to the Delhi site. 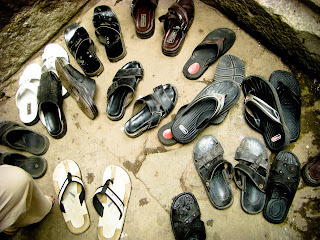 When we finally reached the tiny alleyway that was said to house the tomb, this is what we found outside the gate: an assortment of shoes. 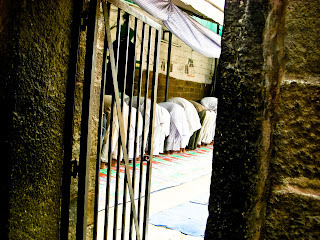 We peaked inside and saw that the area had been turned into a small masjid, and our arrival coincided with prayer time. We waited outside with the mongooses in the sewers until we were given permission to come in. The imam there told me that they don't get many visitors, and when I asked him if the masjid had been there long, he said it was fairly new, "since 1947." Houses crowding all around, alleys full of people, motorbikes and cycles--it's hard to imagine that at one time this place would have been out in the middle of nowhere. Shah Turkman was a bit of a hermit and he insisted on being out in the forest, far away from the rest of society. That was a really long time ago. 800 years ago. There is nothing forest-like left. There is little left that is tomb like. 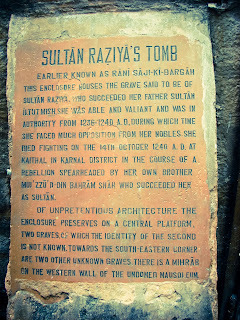 Yes, it's there with a modernly-placed plaque to mark it as the burial place of Razia Sultan and her sister Shazia, but there's not much to it. And that's who Razia Sultan is. She was ahead of her time, appointing slaves to positions of authority and insisting on submission to the spirit of the law, not tradition. She was a competent and efficient ruler. It is seemingly true that her only weakness as a leader was in her being a woman. And she inspired me to go out grave seeking. That's a really interesting story. Her father must've been ahead of his time too, to educate Razia the way he did, and leave her the kingdom. True. He knew what it was like to start off as a slave, though. I love Razia Sultan she's my inspiration P.S I always thought Razia loved Altunia and Altunia loved Razia??? And what about King Yaaldosh? Didn't he want to marry Razia even though he was much older than her??? Razia Sultan is a fascinating historical character. Seema, I would be interested to know the source of your information. I think the story of Razia is fascinating and it is difficult to separate legend from history. If you have a good source, I would love to be able to read its account of what happened in the life of Razia. Where is the burial place of altunia?? Rabia, I have not spent time researching the burial place of Altunia. I only know that it is not with any of the three possible burial sites of Razia. This site claims she is buried here with her sister. Thanks for the information but are u sure that this is razia's tomb ..or I it is then where is Mirza altunia's tomb?? These two are razia & shazia's tomb sure? Alisha, no one is certain that this is Razia's tomb. It is one of three sites that claim to be so. This one has old writing on it claiming to be where Razia and her sister Shazia is born, but it is hard to prove one way or another. I have not researched where Altunia is buried.